STAY ORGANIZED: This tool bag from CLC features 50 pockets to organize all of your tools and accessories. 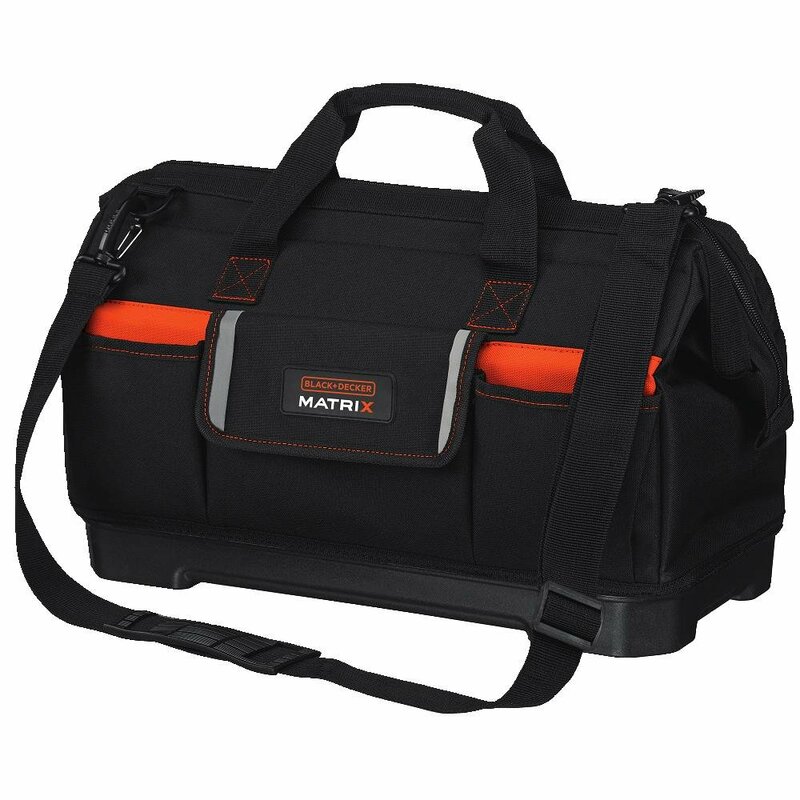 SUPPORTS LARGE HAND TOOLS: This tool bag has a large center compartment to carry multiple power tools and accessories and separate outside compartments. SPILL PROOF TOOL BAG: Zippered side panels on this heavy duty tool bag prevent spillage of tools when carrying or storing bag. Whether you are a construction professional or a do-it-yourselfer, you realize how much easier it is to get the job done when you can find your tools when you need them. Nothing can be more frustrating than fumbling through drawers, boxes, and buckets looking for the one tool you need to finish the job. With that in mind, we decided to review some of the best tool carrying bags on the market. We have divided them into gold, silver, and bronze products. At the end, we will also review one budget bag that does not have the same features as the more expensive models, but still gets the job done. While searching for our gold product, we were looking for something that was going to be sturdy, well manufactured, have the ability to carry multiple tools, and be a bag that you would be proud to take with you on the job site. The Custom Leathercraft tool carrier more than meets all of these requirements. The tool carrier has 54 pockets on the inside, plus four larger pockets on the outside. You can use the inside pockets to store tools that you use infrequently and the outside pockets to provide you with easy access to tools that you use often. The large center compartment is going to be a great place for you to store your power drill, your power saw, or any other larger tool you need to get the job done. The side panels zip closed. This way, you do not have to worry about your bag tipping over and spilling all of your hand tools. One of the most frustrating things that can happen on a job site is needing to dig through your tool carrier to find the hand tool that you need. This problem is addressed thanks to the vertical tool pockets. They allow you to insert your tools partially into the pocket, while at the same time leaving the handle of the tool visible. The bag is large enough to hold the tools that you need, but is not so large that it’s bulky to carry around. Its dimensions are 18 inches in length, 17 inches in width, and 14 inches in height. Empty, the bag weighs 4.6 pounds. You will not need to worry about tools with pointed edges damaging the bag since it is built from a heavy duty poly fabric. It also has a poly ballistic trim. The zippers on the tool carrier are designed to open and close with ease and not get damaged by contact with your tools. The shoulder strap is designed to be adjustable, comfortable, and provide you with a secure way to carry your tools. The bag is not waterproof or water resistant. However, since it is made from a heavy poly fabric, it can hold up well to moisture. Some owners have sprayed the bag with waterproof shoe spray. This way, if it does come in contact with a lot of water, the water will just bead up and slide off the bag. Something you will like about the tool carrier is that even when it is loaded down with a lot of heavy tools, it will still stand upright if it is on a flat surface. It doesn’t matter if the side pockets are open, it still will not tip over. This is due in part to the solid hard base that the carrying case has. Of course, if you put all of your tools on one side of the bag, it will lean to the heavier side because of the extra weight. The center compartment of the tool carrying case is large enough for you to put a full sized hardhat, 12 inch channel locks, and just about any other tool you will need to carry. When the bag is zip closed, it stands approximately 16 inches tall. It can be compressed a little bit if you need to fit it into tight spaces. However, since there are two metal bars on the inside of the fabric to help keep the bag sturdy, it won’t compress so much that it can be squeezed into small spaces. Although the bag does not come with a lock, you can secure your tools by using a TSA lock in the holes on the double zippers. Reviewers on Amazon absolutely loved this product. Of the 470 individuals who reviewed the product, 83 percent gave it 5 out of 5 stars. The bag receives an overall rating of 4.7 out of 5 stars. One reviewer stated that the bag was a great tool for the money and said that he had used the bag for more than 1,300 hours. Since he works in CATV, this bag has hung from wires, been dropped to the ground, and has carried a lot of weight. He feels that his carry bag should work as hard as he does, and so he does not treat the thing gingerly. He is pleased with the product because there has been no tears in the body, the zipper is still intact, and the stitching holds well. An electrician who reviewed the bag said that is the most practical carrying bag he has ever owned. It’s easy for him to keep his tools organized, it’s easy to find, and he can fit his hacksaw, hammer, screwdrivers, and any other extras that he needs inside. The Custom LeatherCraft 18 Multi-Compartment Tool Carrier is all around a great product. It is built by a company that values quality and understands what tradesmen need in order to get their job done well. Husky has made a name for itself as one of the premier tool carrier manufacturers. They have done this by creating high-quality products that stand up to a lot of mistreatment by their users, but still function at a high level. This is definitely the case with the Husky 18 Inch Tool Bag. The bag is constructed with heavy-duty water resistant 600 Denier SpunTuff water resistant materials. 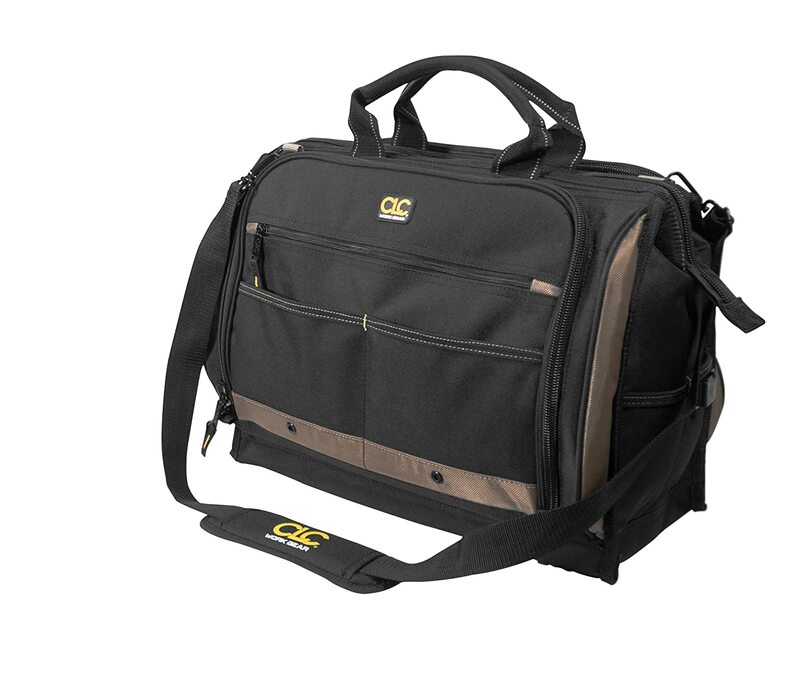 There is more than enough room for all of your tools thanks to the 16 external and 13 internal pockets. The dual zipper top and shoulder strap guarantee that you will be able to secure your tools inside the bag, as well as transport your tools from one place to another without worrying about the strap breaking and your tools spilling all over the floor. The bag is 18 inches long, 10 inches wide, and stands 10 inches tall. You will be surprised at the amount of tools that you will be able to carry. Many individuals use this bag to carry tools that weigh in excess of 40 pounds. If you are currently using a metal box to carry around your tools, you are going to be surprised by how light the Husky tool bag is. Per cubic inch, it is a lot lighter than a metal box. This means that you get more space for your tools and less weight on your shoulders. One of the major complaints that people have about some of the tool carrying cases on the market is that since they are made from such a thin material, it’s easy to snag when your tools rub against it. This is not a problem with the Husky. It is designed to carry tools that have different shapes, that come to a point, and that have sharp edges. Another nice feature is that the internal and external pockets are very sturdy. This means that when you stick a tool in the pocket, it stands in its place. It doesn’t flop around on you or end up falling inside or outside your bag. The internal pockets are lined with elastic. This way, when you put tools in them or when the tool bag moves around, you don’t have to worry about your pockets stretching and then breaking. Let’s be honest, once in the pockets on a carrying case break, the carrying case is all but worthless. Nothing can be more frustrating when working on a construction job than having to dig around inside of your tool carrying case looking for fasteners. The Husky carrying case addresses this issue by providing zippered pockets where you can safely store small items and not worry about them falling all over the inside of the bag. 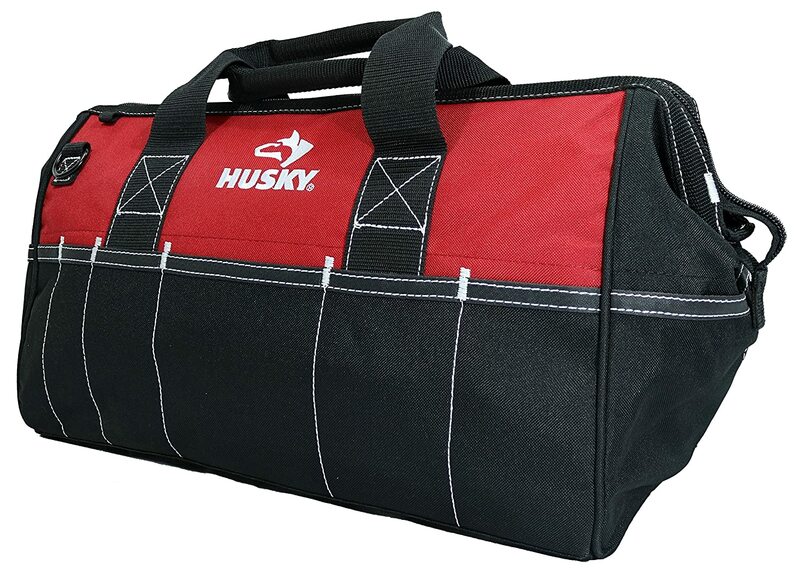 The Husky 18 inch tool bag has not received a lot of reviews on Amazon. There’s about 30 of them. However, the individuals who have reviewed the product have been overwhelmingly positive. This is one of the few products on Amazon that have an almost perfect rating, receiving 4.8 out of 5 stars. Most reviewers commented on how sturdy the bag was, how easy it was for them to carry it from one place to another, how it has well spaced pockets on the inside and on the outside, and how the center section is large enough to fit a cordless drill, extra batteries, and other large tools that are needed. The Husky is definitely a winner. It can hold up to use in a professional setting and also makes a perfect bag for do-it-yourselfers who do the occasional project at home. Black & Decker is known around the world as a respected tools manufacture. As such, it would only make sense that they would create a great storage bag for tools. The Black & Decker wide mouth storage bag is our bronze pick because it is durable, flexible, and reliable. The bag itself is very light, weighing only 3.6 pounds. It is 21 inches long, 5 inches wide, and stands 8.5 inches tall. The bag has been designed to carry and to protect the Black & Decker matrix system. The Matrix system is a multi tool in one device that allows the user to switch out the head of the tool they are using to make it a drill, a sander, or a saw. And so the divisions inside the bag are the perfect size for each one of these attachments. However, this does not mean that the bag can only be used by individuals who have purchased the Matrix system. It has a wide mouth. This means that you do not need to struggle to get larger tools inside the bag. The separated compartments make it easy to store the Matrix system, the accessories that come along with it, or for individuals who do not have the Matrix system, to store their power tools as well as their hand tools. Since the bag has a durable hard plastic base, when you set it down on the ground, it’s not going to easily topple over. There are two rigid dividers that keep your tools separated. When transporting the bag, you have the option of using the shoulder straps or just carrying the bag using the top handles. Another nice feature about the bag is that the dividers inside the bag are held in place by Velcro. So you can remove them to give yourself more space to add even larger tools. Although the bag is made of a heavy-duty nylon canvas material, it is not waterproof. If a small amount of water splashes on it, it will provide moderate protection for your tools. However, if the bag is left on the bed of the truck during a rainstorm, your tools will get wet. It is recommended that you use a water repellent spray on the exterior of your bag. If it does come in contact with rain, the water will just bead and roll off the bag. As we mentioned at the outset, the bag is designed to work with the Black & Decker Matrix system. However, as multiple reviewers on Amazon proved, the bag is a perfect way to carry tools for just about any industry. There is a reviewer who says that they take this bag to carry their gear when they’re working in agricultural fields. What they like about it is that the bag has a soft body and a long strap, so they can carry it throughout the day with less pain. They also like that the bottom is hard plastic. This means that they can set the bag down in the mud without worrying about it getting beat up. Another reviewer said that it was durable, rugged, and lightweight. They were able to take the tools they used to store in five gallon buckets and fit them all into this one bag. Another individual says that they consider this bag to be the best bargain they purchased in their life. This reviewer is using the bag as an emergency preparedness kit in their vehicle. They’re using it in this way because it’s sturdy and holds all of the things they feel they will need in case of emergency. Reviewers on Amazon really appreciate this product. It has received more than 340 reviews, with a total of 4.7 stars out of a possible 5 star rating. Stanley is a well-known name in the handheld tool industry. They have designed an inexpensive bag that will allow you to keep your tools organized and get quick access to the tools you need. Their 12 inch soft sided tool bag weighs around one pound and has dimensions of 11.9×5.1×9.9 inches. The adjustable strap makes it easy for you to carry all of your tools with you where ever you need to go. 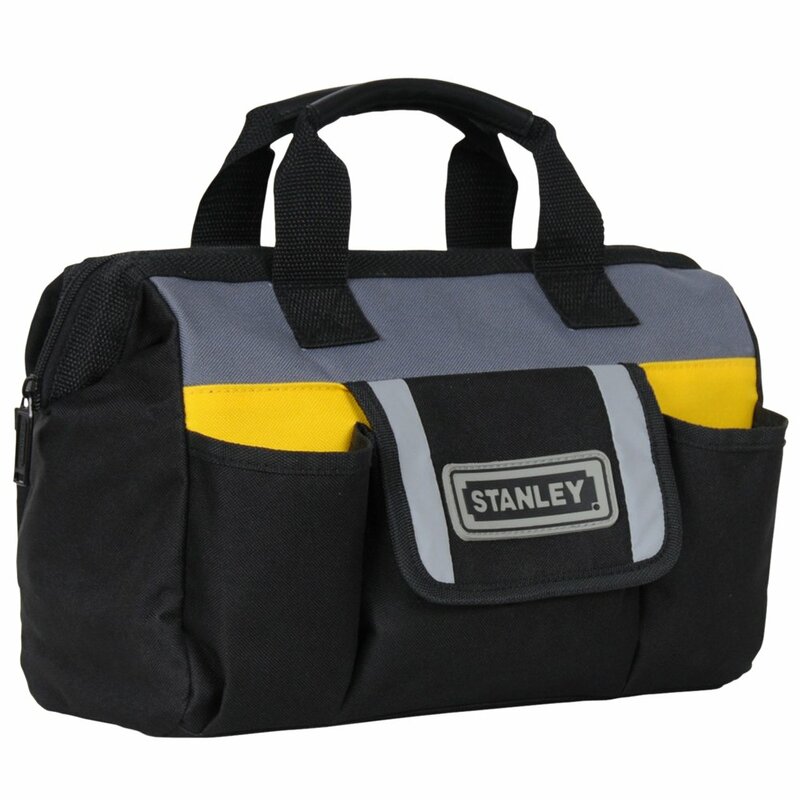 The Stanley carrying bag comes equipped with a rubber foam bottom that not only keeps the bag clean, but it also protects what you have inside the bag if the bag should fall. The exterior of the bag is covered in an outer mesh that allows you to store your personal items like a cell phone or your wallet. Stanley has built a reputation because of the guarantees they offer for their products. For this reason, we were not surprised that the Stanley bag came with a lifetime limited warranty. On the outside, there six pockets, three on each side. The middle pocket is the biggest, then on one side there is a smaller pocket that has a Velcro flap. On the other side there is another pocket store things without a flap. The bag is not waterproof, but its tough material can resist a light rain. It is recommended that you use a waterproofing spray on the exterior of the bag to provide more protection for your tools on the inside. The bag does not have a lock. It is not a hard case carrier. So while it is not designed to secure your products, it is designed to allow you to carry them from one place to another in a safe and convenient way. It is not surprising that reviewers on Amazon loved the product. It got 4.6 out of five stars from 790+ reviewers. Many comment on how perfectly this worked for carrying household tools, especially for the casual handyman. It is important to consider the strength of the material that you are using. Materials like canvas and nylon are usually what tool carrying bags are made from. Tools by their very nature have jagged edges and can be sharp. And so your tool bag must be designed from a material that can stand up to the stresses that your tools will put on the bag. Also, your tools are heavy. If you load up a tool bag with all of your hand tools and power tools, you can easily be lugging 50 pounds around. The last thing you want is a bag that is made out of a flimsy material that will break, embarrassing you in front of coworkers and potentially damaging your tools. We cannot emphasize enough how important it is for you to test the zippers on the bag you are going to use. If the zippers are weak, they are going to break off and make the entire bag unusable. Very few things are going to frustrate you more than trying to force open the zipper on your tool bag when you need to get to something important. You want to make sure that you have durable fasteners as well, as these are needed to support the weight of your tools. Most tool bags are not going to be 100 percent waterproof. But you want them to be made of a thick enough material that if it gets caught out in the rain for a few minutes, the tools you have inside your bag will not get ruined. There are waterproof sprays that you can use to make your bag more water resistant. Well-placed and well-designed pockets are what set a good tool carrying bag apart from others. You want to have pockets that are big enough for the tools that you want to carry. You definitely want multiple vertical pockets where you can put tools upright and easily grab them. You are going to be putting your bag on the ground in some very rough environments. This could cause wear and tear on the bottom. If your bag has even small feet, it can keep the bottom of the bag an inch or so off the ground, so the fabric is not constantly rubbing against it. Carrying a bag full of tools can start to take its toll on your body after a few months. It’s best to have a tool bag that has a wide strap and padding. This helps you support the weight of your tools without damaging your body. Every tool bag has its own features. What you need to figure out is what is the right tool bag for you and for the work that you are doing. If you are only going to be doing small repair jobs using hand tools, then maybe a smaller bag is right for you. However, if you’re constantly carrying your power tools from one place to another, you are going to need something that’s heavier and that’s more rugged. We encourage you to do your due diligence and research the products you are looking to buy. This way, you can make sure that the bag you get is one that is going to work well with you.